If you have been injured in a Lowell car accident, it is important to consult an experienced lawyer as soon as possible. Breakstone, White & Gluck of Boston has over 100 years combined experience handling Massachusetts motor vehicle accident cases. We offer a free legal consultation to help you understand your rights. Contact our attorneys at 800-379-1244 or 617-723-7676 or use our contact form. As texting while driving has increased, Massachusetts State Police and local communities have cracked down in Merrimack Valley. In the spring of 2013 alone, State Police cited 440 drivers. Enforcement was funded by a grant from the National Highway Transportation Safety Administration. Lowell is the fourth largest city in Massachusetts, with over 106,000 residents. It is located 25 miles northwest of Boston along the Merrimack River. Commuters travel in each day to work at employers such as Lowell General Hospital, Middlesex Community College and the University of Massachusetts at Lowell. Others travel out to Boston on the MBTA commuter rail, which stops at the Charles A. Gallagher Transit Terminal on Thorndike Street. The site is operated by the Lowell Regional Transit Authority. Many commuters travel by car, accessing the city from nearby Interstate 495, the Lowell Connector, Route 3 or Interstate 93. These are busy roads. Motor vehicle accidents can happen quickly as drivers rush to and from work or other destinations without paying full attention. Accidents can also happen when drivers speed, text, talk on a cell phone, fail to stop at red lights or tailgate other vehicles. 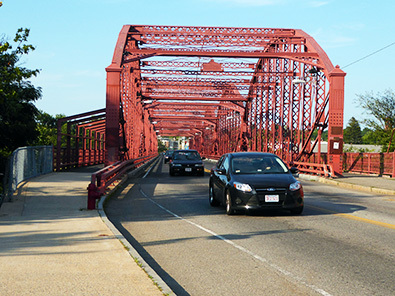 For pedestrians and bicyclists, Lowell can be a challenging city. Off Thorndike Street and its former mill buildings, the Gallagher Transit Terminal is hard to access by foot. Intercity bus and car are the the best ways to reach the transit terminal and MBTA service. The city's college students commute between UMass Lowell's two campuses. They are separated by the Merrimack River and Oullette Bridge (Aiken Street Bridge). The school offers a busy shuttle service, but students (and others) still travel by foot at times, creating a heightened need for drivers to pay attention and travel slowly. Additional traffic concerns rise in densely populated neighborhoods near Lowell City Hall, the schools and along Aiken Street, where part of the UMass campus and the Lowell Spinners baseball field are located. The Lowell Spinners are a minor league affiliate of the Boston Red Sox and play at Edward A. LeLacheur Park. Also bringing in drivers are the Tsongas Arena and the National Park Service, which displays exhibits related to Lowell's mill history. After a car accident, you should seek medical attention for your injuries. Then, before you do anything else, contact an experienced car accident lawyer to learn your rights. Until you do, it is in your best interest to avoid contact with insurance companies and their representatives. Breakstone, White & Gluck of Boston is experienced at handling personal injury and car accident claims in Massachusetts. We offer a free legal consultation and explain your rights and the process of hiring an attorney. For a free legal consultation, contact our attorneys toll-free at 800-379-1244 or 617-723-7676 or use our contact form.